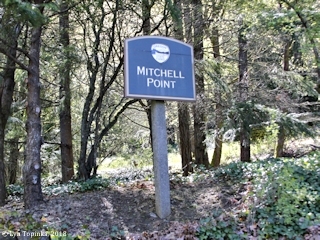 "Mitchell Point and Mitchell Spur, Oregon"
Click image to enlarge Sign, Mitchell Point, Oregon. Image taken April 19, 2018. 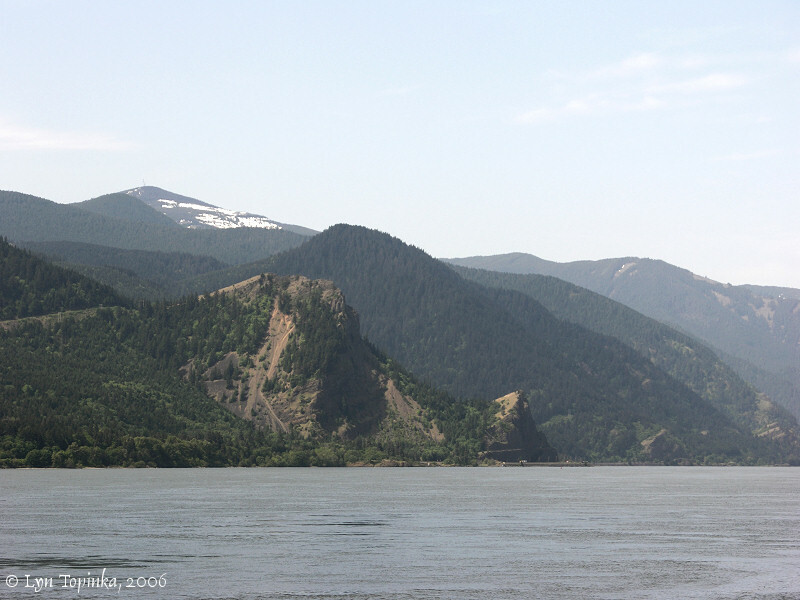 Mitchell Point (1,178 feet) and Mitchell Spur (490 feet) are located on the Oregon side of the Columbia River at River Mile (RM) 163.5. Upstream is Mitchell Point Drive (a remnant of the Historic Columbia River Highway), Ruthton Point, and Hood River. Downstream is Perham Creek, Viento Creek and Viento State Park, and Starvation Creek and Starvation Creek State Park. Across the river on the Washington side is Drano Lake and views of the Washington State Highway 14 tunnels. Before construction of Interstate 84, Mitchell Point was the location of scenic tunnel on the Historic Columbia River Highway. 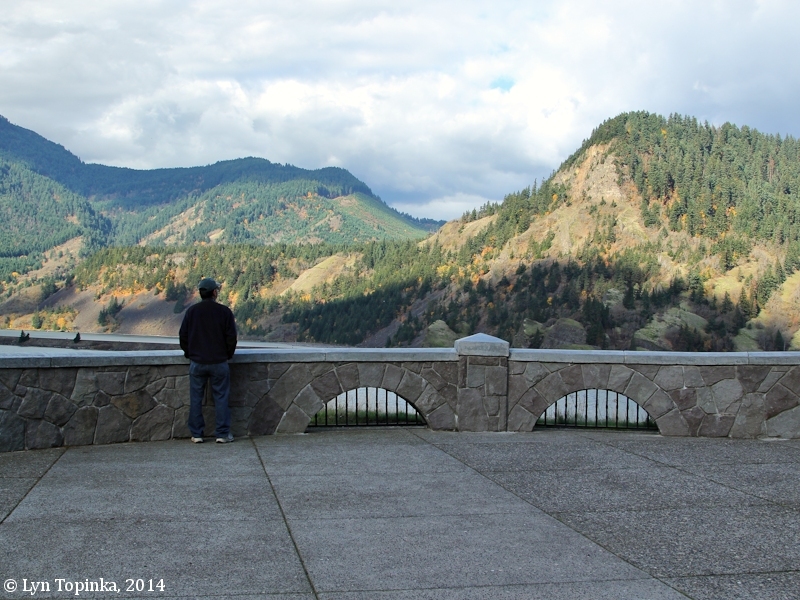 Today the overlook at the base of Mitchell Point provides great views of the Columbia River Gorge. The Broughton Flume can be seen perched on the Washington hillsides across from the point. "Beyond the fact that a man named Mitchell lived and died near this point, there is little information available. He is reported to have been a trapper. Although there have been efforts to change the name to Storm Crest, the public has not looked with favor on the suggestion and prefers the old name. 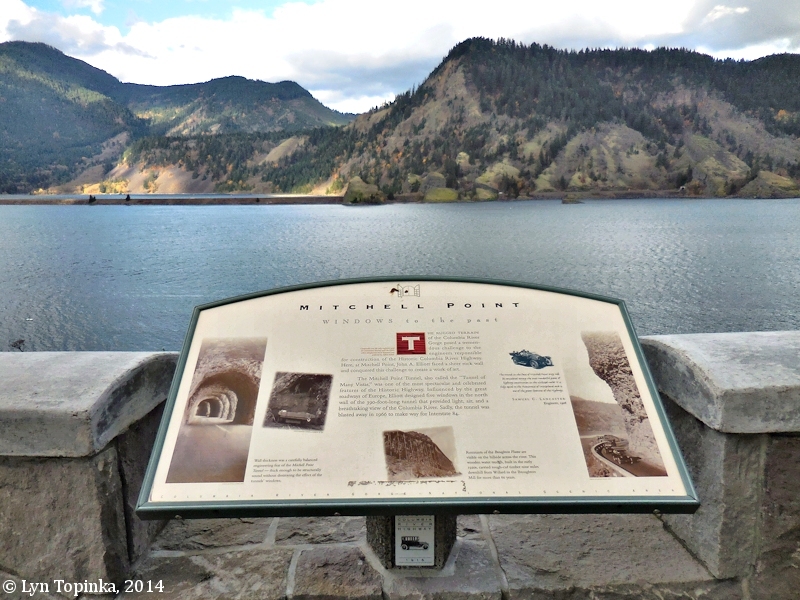 The famous Tunnel of Many Vistas on the Historic Columbia River Highway pierced Mitchell Point but was destroyed when I-84 was constructed." 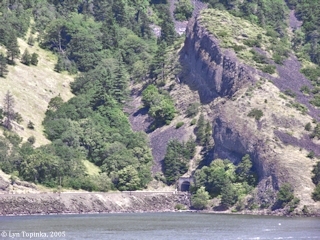 The Mitchell Point Tunnel was known as the "Tunnel of Many Vistas" and was located on the Historic Columbia River Highway. A viaduct was built west of the tunnel while the tunnel was blasted through solid rock. It featured five windows overlooking the Columbia River. 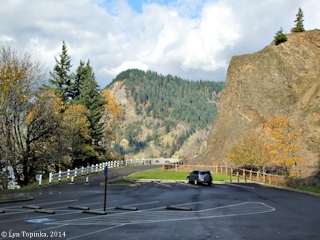 The Viaduct and Tunnel served as the primary car and truck route along the Columbia until 1932 when the Tooth Rock Tunnel was opened, offering an alternative route. In 1955 Interstate 84 was built along the Columbia River, permanently closing the narrow Mitchell Point Tunnel. Then, in 1966, because of crumbling conditions, the famous "Tunnel of Many Vistas" was blasted from the cliff. Today (2018), there is discussion to re-bore another tunnel at Mitchell Point to connect sections of the Historic Columbia River Highway State Trail. The Mitchell Point Tunnel was designed and constructed by John Arthur Elliott. Click image to enlarge Penny Postcard: Mitchell Point Tunnel, ca.1920. Penny Postcard, ca.1920, "Mitchell Point Tunnel, Columbia River Highway, Oregon". Published by Wesley Andrews, Inc., Portland, Oregon, Card #825. In the private collection of Lyn Topinka. Click image to enlarge Penny Postcard: Mitchell Point Tunnel, ca.1930. Penny Postcard, ca.1930, Postmarked 1951, "Mitchell's Point Tunnel. 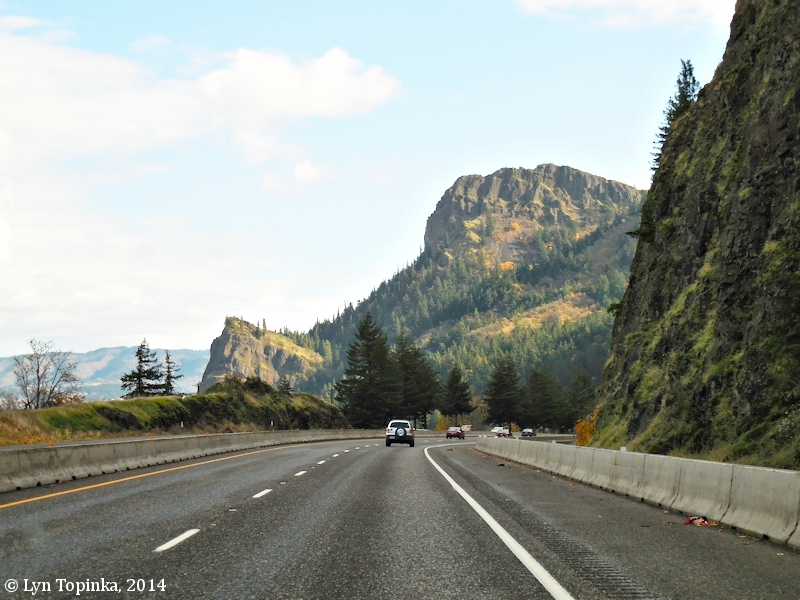 Columbia River Highway, Oregon.". Image Copyright Cross & Dimmitt. Published by Angelus Commercial Studio, Portland, Oregon. In the private collection of Lyn Topinka. Click image to enlarge Penny Postcard: Mitchell Point Tunnel, ca.1920. Penny Postcard, ca.1920, "Viaduct and Tunnel at Mitchell's Point from Columbia River Bank, Columbia River Highway, Oregon.". Published by The Oregon News Co., Portland, Oregon. Card #40. In the private collection of Lyn Topinka. 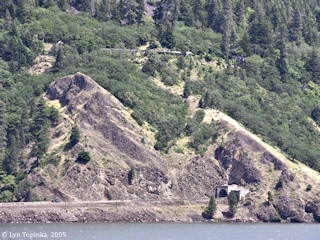 Click image to enlarge Historical Columbia River Highway path (fence) at Mitchell Point, Oregon, as seen from Interstate 84. View from moving car, heading west on Interstate 84, looking up at Mitchell Point. Area behind fencing was once the location of the "Tunnel of Many Vistas". Image taken September 25, 2017. "MITCHELL POINT TUNNEL (watch for traffic signals) 130.3 m., was bored through a cliff overhanging the river. In its 385-foot length are hewn five large arched windows overlooking the Columbia. The great projecting rock through which the bore was made was known among the Indians as the Little Storm King, while the sky sweeping mountain above was called the Great Storm King." 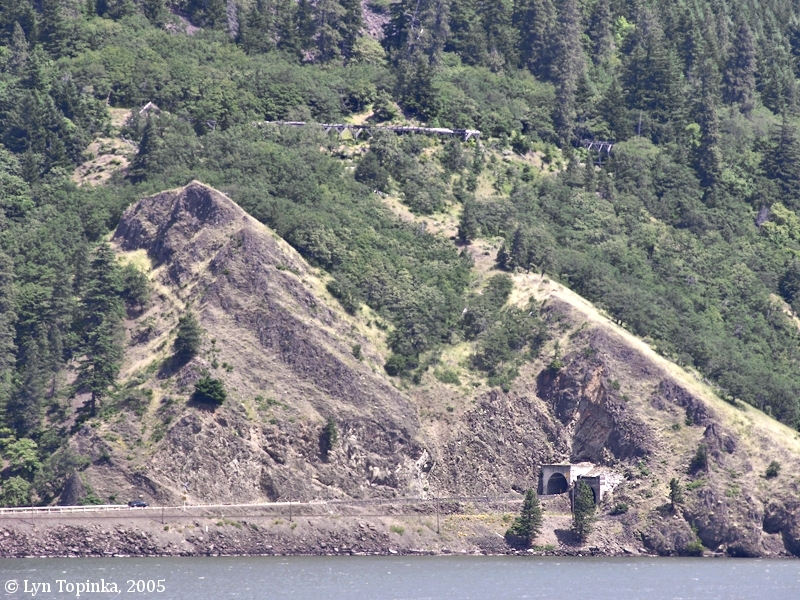 Click image to enlarge Mitchell Spur and Mitchell Point, Oregon, as seen from Interstate 84. View from moving car, heading east on Interstate 84, looking at the western side of Mitchell Point. Image taken November 10, 2014. Click image to enlarge Mitchell Point from Ruthton Park, Oregon. Image taken June 4, 2005. 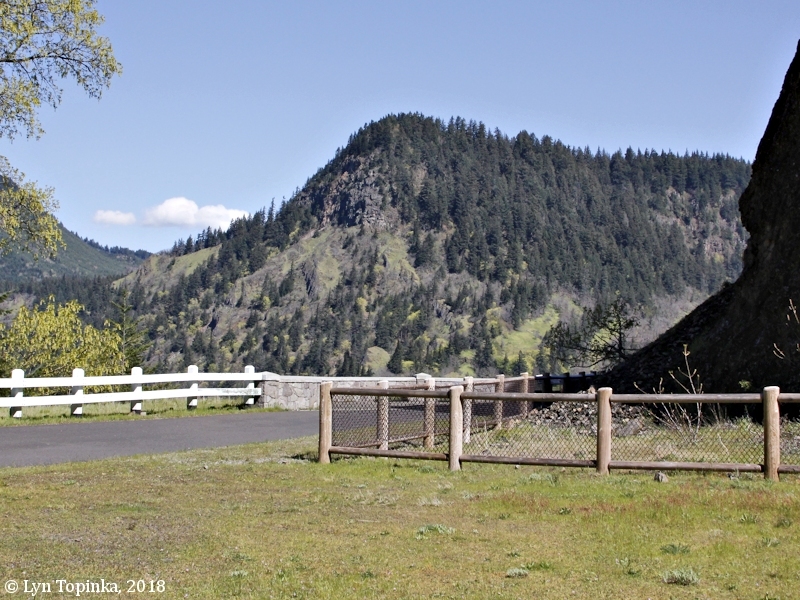 Mitchell Point consists of Grande Ronde Basalt dipping 30 degrees to the southeast, and is capped by 100 feet of Troutdale Formation quartzitic gravels, which in turn are overlain by later lavas. 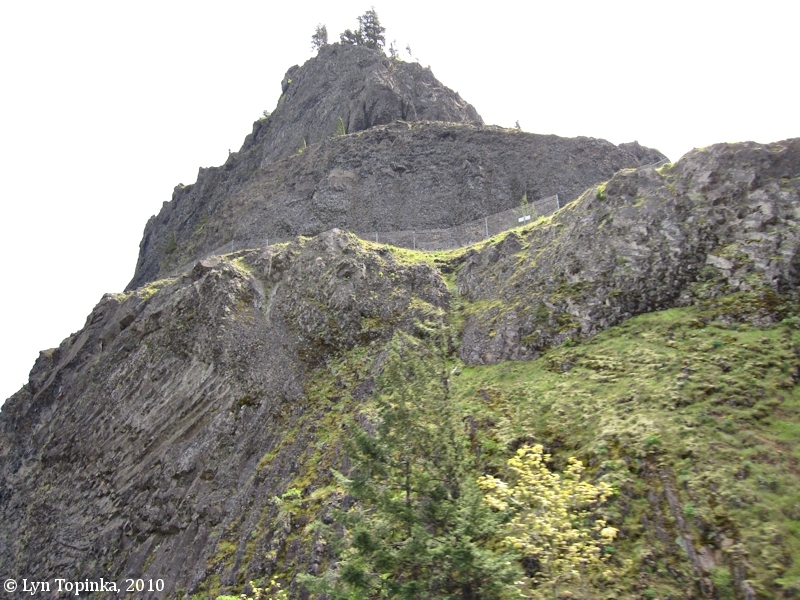 Click image to enlarge Mitchell Spur as seen from Mitchell Point trailhead, Columbia River Gorge, Oregon. Image taken November 10, 2014. 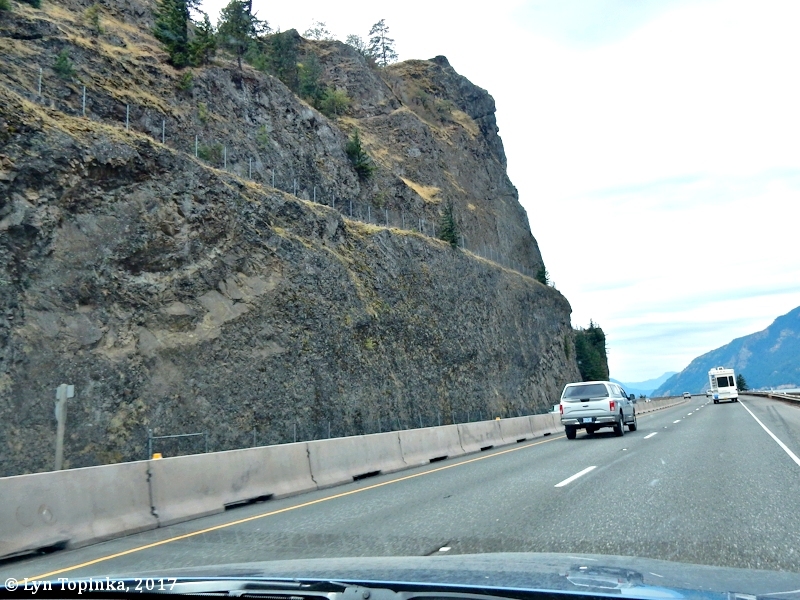 Click image to enlarge Historical Columbia River Highway path (fence) at Mitchell Point, Oregon, as seen from Interstate 84. 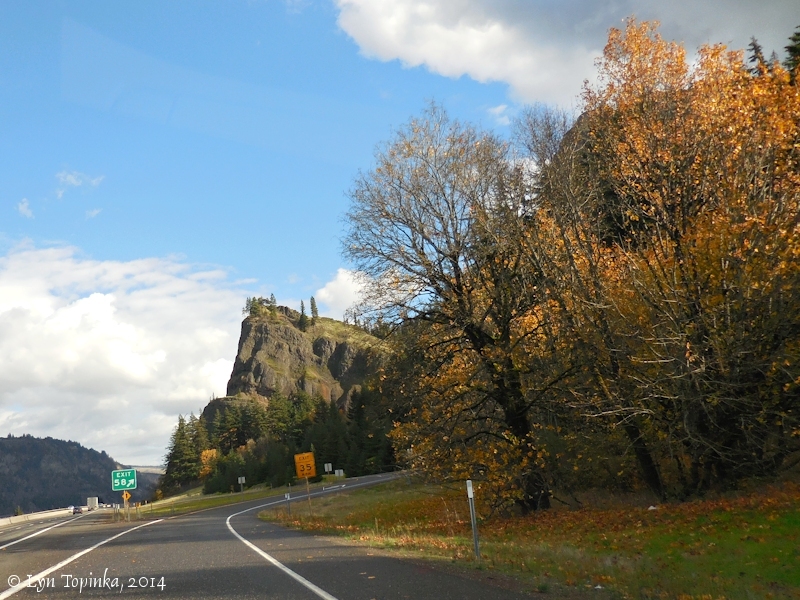 View from moving car, heading east on Interstate 84, looking up at Mitchell Point. Image taken April 18, 2010. "SCENERY ALONG AUTO ROUTE NOW BEAUTIFUL"
Hood River City and Valley Residents Are Awakening to Splendor of Natural Wonders Lying on Pathway to Their Doors. "An insight into the prophecy of LeRoy Armstrong in his "Hagar's Son," a story recently appearing in Sunset and which dealt with the Columbia River road of the future lined with hundreds of Summer homes, may be had when one takes a peep at the residence of C.W. Parker, a handsome long bungalow built beside the proposed highway just beyond the ramparts of Mitchell's Point. Mr. Parker has passed his life in newspaper work. His work has taken him all over the world, but of all the spots that he has seen, he says, he is most pleased with that in the Columbia Gorge, which, he says, he has selected as his Summer home. The log walls of the livingroom have many windows opening out on terraces and from which one may look to the west for miles down the Columbia. The view presented at sunset is particularly gorgeous. In Summer time the sun seems to drop out of sight in the very center of the gorge. Mr. Parker believes that it will be but a short time until the Columbia's banks will be dotted with many such homes. The Columbia will be the Western Hudson." Click image to enlarge NEWSPAPER Illustration, "C.W. 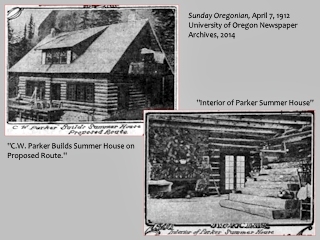 Parker Builds Summer House", Mitchell Point, Columbia River Highway, Oregon. 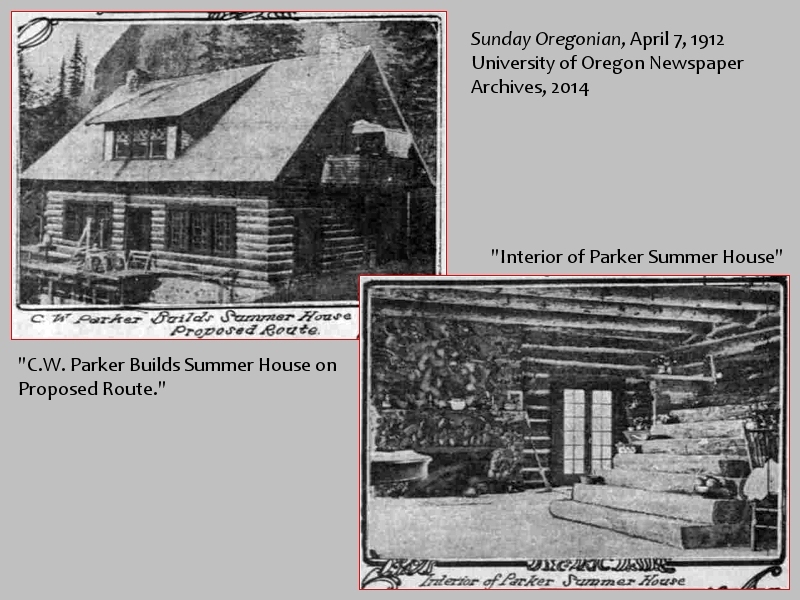 Source: "Sunday Oregonian", April 7, 1912, courtesy University of Oregon Newspaper Archives, 2014. Source: "Sunday Oregonian", April 7, 1912, courtesy Historic Oregon Newspapers Archives, University of Oregon Libraries, 2014. "Picturesque Homes Will Be Built Along The Columbia Highway"
"The first picturesque home to be built in Hood River county along the route of the Columbia highway has been constructed just west of Mitchell Point by C.W. Parker. The "Little Boy Ranch," such is the name given the place, on account of its unique beauty arouses the admiration of all who see it. The house is constructed of great hewn logs. It presents the work of master craftsman. And the interior shows the same picturesque blending. Huge fireplaces yawn at each end of a large living room, from the center of which a large stairway leads to the second story. The grounds have been terraced and beautified. 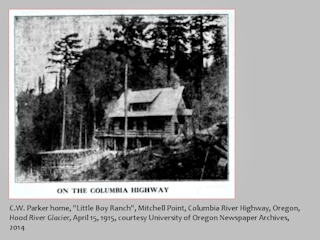 The home of the Little Boy ranch may be taken as a harbinger of what we may expect along the scenic Columbia highway." 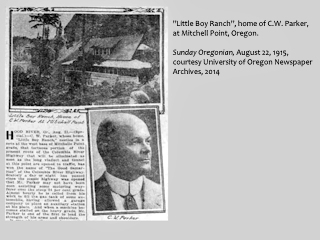 Click image to enlarge NEWSPAPER Illustration, "Little Boy Ranch", Mitchell Point, Columbia River Highway, Oregon. Source: "Hood River Glacier", April 15, 1915, courtesy University of Oregon Newspaper Archives, 2014. Source: "Hood River Glacier", April 15, 1915, courtesy University of Oregon Newspaper Archives, 2014. MITCHELLS POINT HAS ITS "GOOD SAMARITAN"
C.W. Parker, Who Lives at Base of Noted Grade on Scenic Highway, Gives Aid to Scores of Stalled Motorists. "HOOD RIVER, Or., Aug.21. -- (Special.) -- C.W. 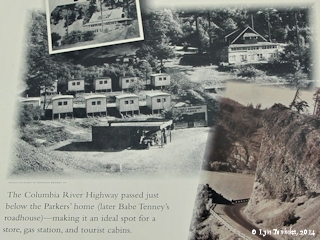 Parker, whose home, "Little Boy Ranch," nestles in a cove at the west base of Mitchells Point grade, that tortuous portion of the present route of the Columbia River Highway that will be eliminated as soon as the long viaduct and tunnel at this point are opened to traffic, has won the name of "The Good Samaritan" of the Columbia River Highway. Scarecely a day or night has passed since the scenic highway was opened that Mr. Parker may not have been seen assisting some motoring wayfarer over the steep 24 per cent grade. Almost hourly he is called from his work to fill the gas tank of some automobile, having allowed a garage company to place an auxiliary station at his place. And when a machine becomes stalled on the heavy grade, Mr. Parker is one of the first to lend the strength of his arms and shoulders. The entire main floor of the Parker home is given over to an enormous living-room. Two cavernous fireplaces, one at either end of the building, throw out a glow of cheer in the cool seasons. Around the entire home runs a broad, glass-inclosed veranda. The west view from this porch is declared one of the best along the entire length of the Columbia River. The towering crags of Mitchells Point rear themselves directly behind the rustic home. "Little Boy Ranch" home was completed four Summers ago. "I knew then," says Mr. Parker, "that it would only be a question of time until the highway would be built along the Columbia." "I will be very glad," says the hospitable owner of the artistic home, "when the tunnel and viaduct are ready for traffic, not that I am not willing to assist every automobilist that may get stuck on the grade, but I now live in constant fear lest somebody may be injured in an accident on this steep, twisting road. As you will see from wood strewn along the hillside, I have carried half a cord up after slowly moving machines, using the pieces for scotch blocks, whenever cars stall."" 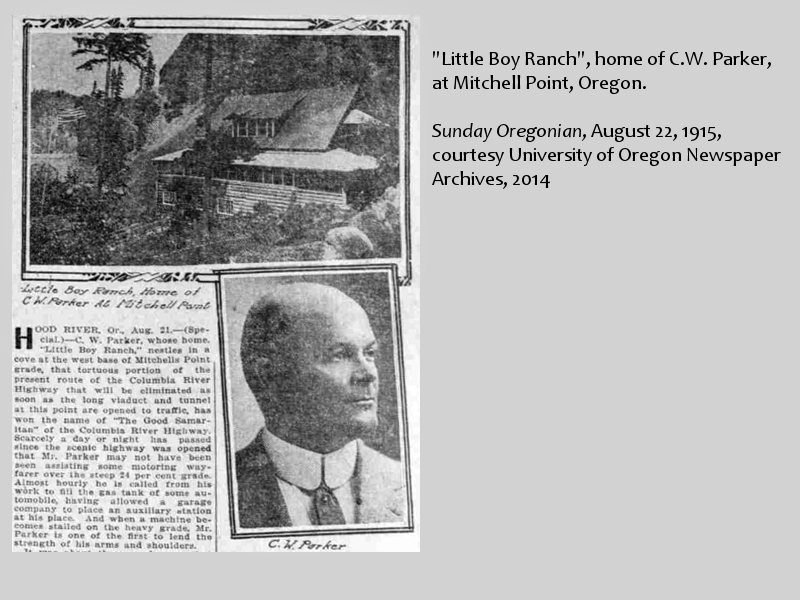 Click image to enlarge NEWSPAPER Illustration, "Little Boy Ranch", Mitchell Point, Columbia River Highway, Oregon. Source: "Sunday Oregonian", August 22, 1915, courtesy University of Oregon Newspaper Archives, 2014. Source: "Sunday Oregonian", August 22, 1915, courtesy Historic Oregon Newspapers Archives, University of Oregon Libraries, 2014. "In 1912, Charles W. and Helena Parker established a summer home here at Mitchell Point. 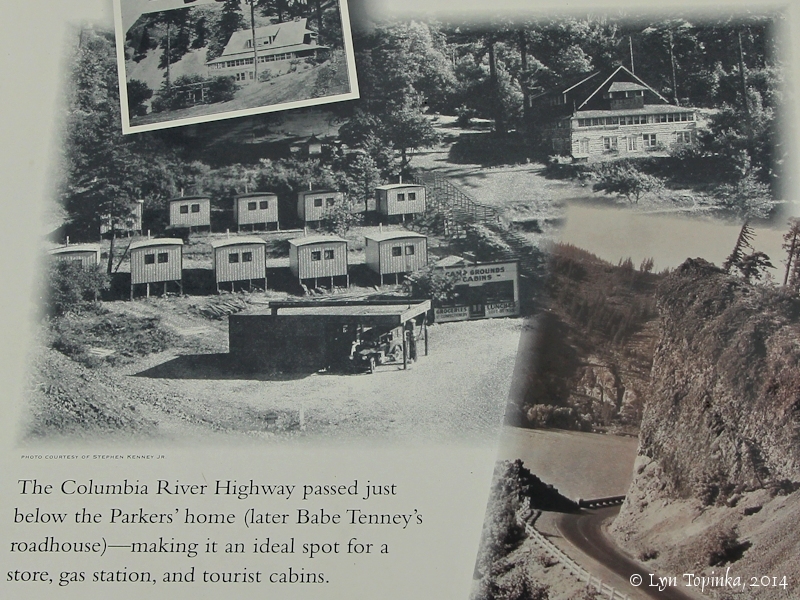 With the construction of the new Columbia River Highway and Mitchell Point Tunnel (east of here) in 1915, the Parkers' place became a one-of-a-kind landmark. Motorists stopped here to enjoy the grand view of the river -- and to admire the "Tunnel of Many Vistas," an engineering marvel of the day. In the early 1930s, Elsie "Babe" Tenney, a single mother from Oklahoma, bought the Parker property. A savvy and hard-workng businesswoman, Babe ran a grill, service station, roadhouse, and rental cabins -- all while raising two sons. Throughout Prohibition and the Great Depression, Babe's tourist stop earned a reputation as a place to cast away cares and woes. Here, you could eat a hearty meal, Lindy Hop (swing dance) to a hot Portland band, and rent a room for the night. Rumor has it that moonshine may have enlivened the good times. Babe Tenney died in 1944, and her family sold the property. Later owners built a small motel. By the 1950s, the new water-level highway (Interstate 84) bypassed the site and business suffered. 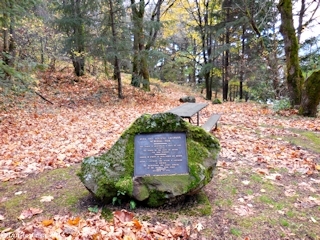 The owners donated the property to the state for a park. In the early 1960s, all the buildings were removed." Source: Information sign, Mitchell Point, November 2014. Click image to enlarge Detail, information sign, Cabins, Gas Station, and Roadhouse, Mitchell Point, Oregon. Image taken November 10, 2014. Click image to enlarge Detail, information sign, Shell Station, Motel, and Roadhouse, Mitchell Point, Oregon. Image taken November 10, 2014. According to D.K. 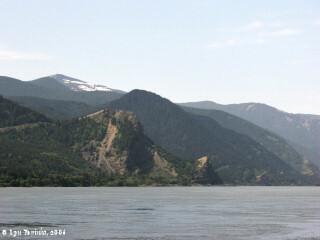 Norman and others (2004), Mitchell Point consists of Grande Ronde lavas of the Columbia River Basalt Group (early Miocene, erupted between 17 million and 5.5 million years ago) dipping 30 degrees to the southeast, capped by 100 feet of Troutdale Formation quartzitic gravels (Pliocene, 5.3 to 1.8 million years ago), which in turn are unconformably overlain by later lavas (Pliocene to Pleistocene) with low initial dip. Mitchell Creek is a short (less than a mile) intermittant stream which drains the west flank of Mitchell Point. According to "waterfallsnorthwest.com" website (2018), Mitchell Creek Falls is the unofficial name for a 15-foot drop falls located on Mitchell Creek. 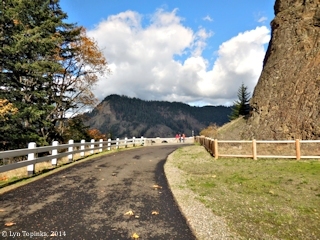 In November 2012, the "new" overlook of the Columbia River at Mitchell Point opened. 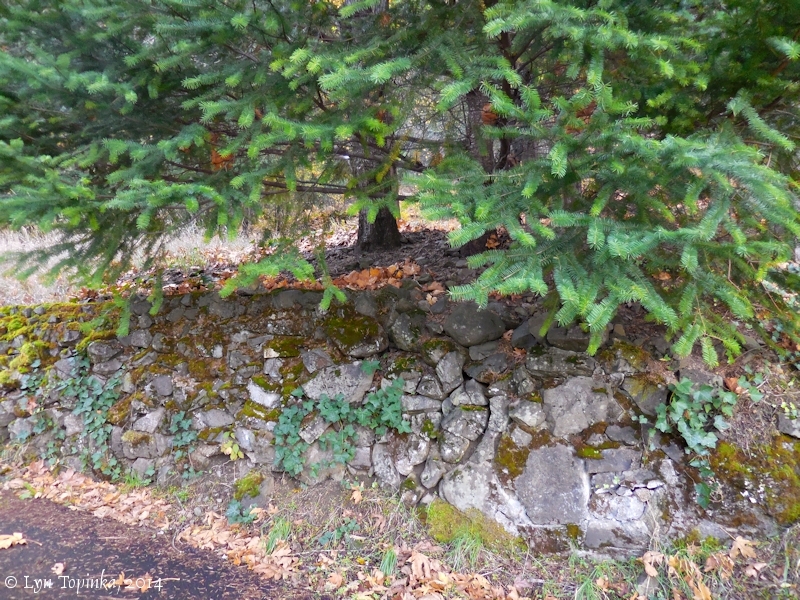 Stonework wall is reminiscent of the original Columbia River Highway walls. Click image to enlarge New overlook (opened in November 2012) at Mitchell Point, Oregon. Image taken November 10, 2014. 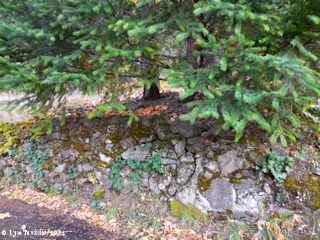 Click image to enlarge Stonework wall at overlook at Mitchell Point, Oregon. Image taken November 10, 2014. 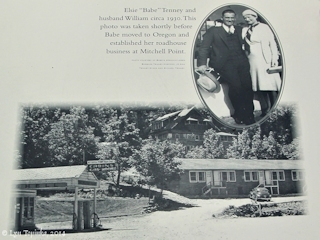 Click image to enlarge Information sign at overlook at Mitchell Point, Oregon. Image taken November 10, 2014. 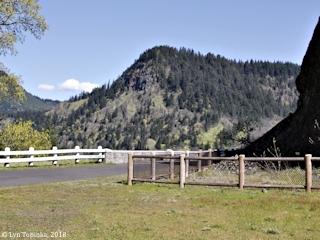 Click image to enlarge Overlook at Mitchell Point, as seen from Mitchell Point Trailhead, Oregon. Image taken November 10, 2014. All of the buildings were removed from the Mitchell Point area in the 1960s. 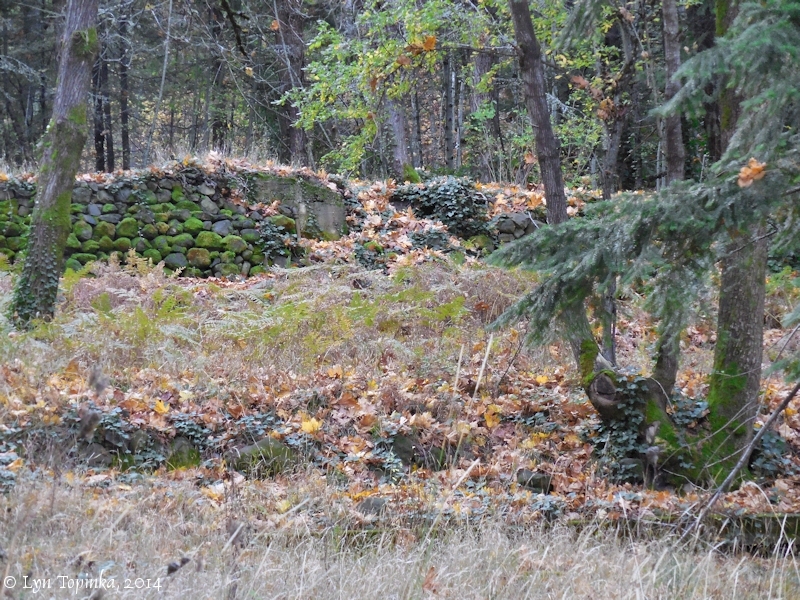 All that remains today are stone walls and concrete foundations. Click image to enlarge Walls and foundations, Mitchell Point, Oregon. Image taken November 10, 2014. 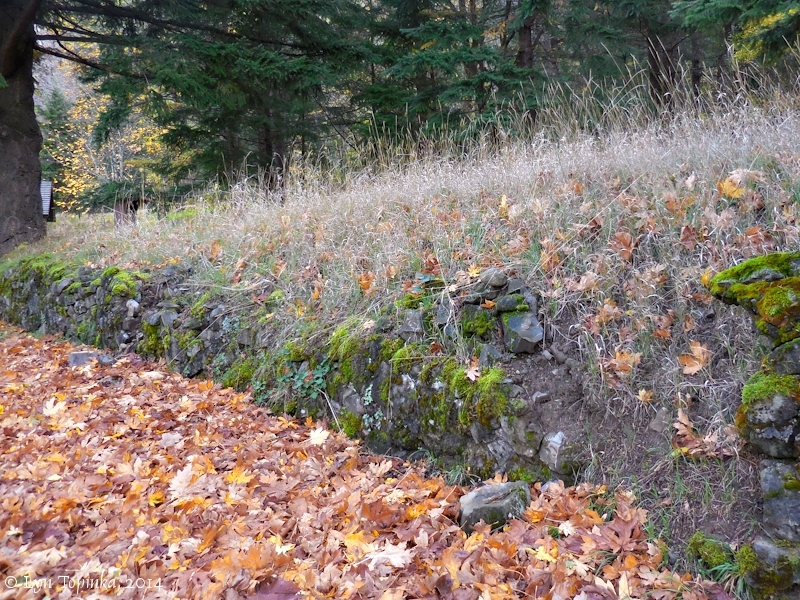 Old Columbia River Highway retaining wall (bottom), Motel slab (middle), and Roadhouse retaining wall/foundation (furthest back). 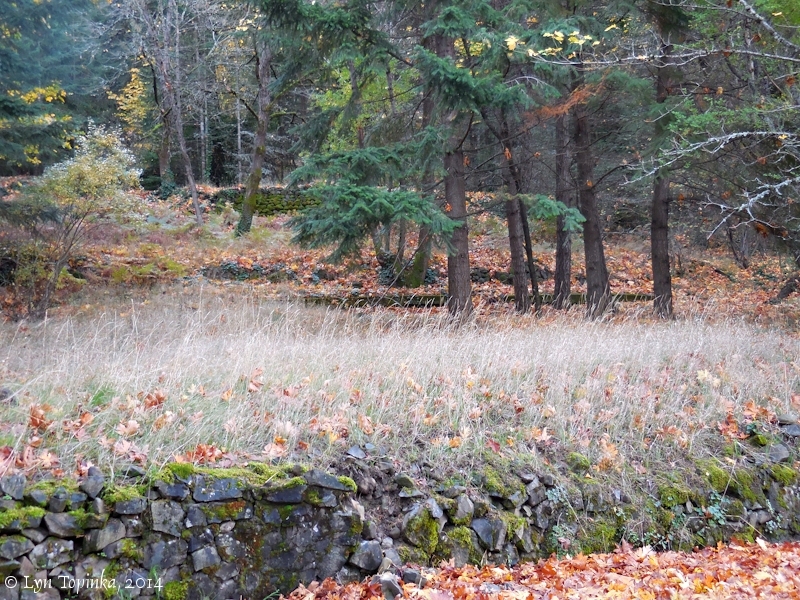 Click image to enlarge Old Columbia River Highway retaining wall, Mitchell Point, Oregon. Image taken November 10, 2014. Click image to enlarge Roadhouse retaining wall, Mitchell Point, Oregon with old motel foundation lower right. Image taken November 10, 2014. "... The Station west of Hood River bore an unusual name. It was formerly called Mitchell, but owing to confusion with another place in the state of the same name, it was decided by railroad officials to make a change. Mr. and Mrs. Charles Parker, owners of the Little Boy Ranch just west of Mitchell Point, tried to have the station named Little Boy, but this was not acceptable to the railroad because it was awkward in telegraphy. Mrs. Parker's nickname, Sonny, was finally selected as the next best thing." Today this would be the approximate location of the exit from Oregon Highway 84 heading up to the Mitchell Point overlook. Click image to enlarge Mitchell Point exit off of Interstate 84, looking at Mitchell Spur, Mitchell Point, Oregon. Image taken November 10, 2014. "... The great projecting rock through which the bore was made was known among the Indians as the Little Storm King, while the sky sweeping mountain above was called the Great Storm King. ..."
"Storm Crest", a name which often shows up on early 1900s Penny Postcards, was another name used in reference to Mitchell's Spur, and the Mitchell Point Tunnel was called "Storm Crest Tunnel". "H. Ellsworth Bassett, an artist of Newark, N.J., who has just finished a sketching tour of the Pacific coast national parks, is visitng at the Little Boy Ranch, the country home of Mr. and Mrs. C.W. Parker. Mr. Bassett will make paintings of Mitchells Point, the towering cliff, known to the early Indians as Storm King, and the famed tunnel with its open windows looking upon the Columbia. The painter while here will make excursions to mid-Columbia streams for trout fishing." Source: "Hood River Glacier", July 17, 1919, courtesy Historic Oregon Newspaper Archives, University of Oregon Libraries, 2014. "HOOD RIVER, Or., Sept.29 -- (Special.) 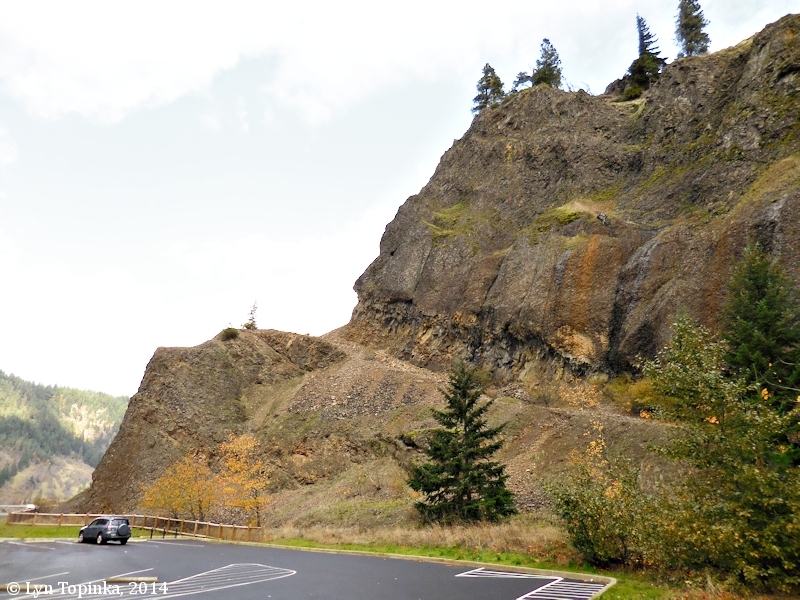 -- Edgar Locke, owner of the face of Mitchell's point, the huge cliff jutting out over the Columbia river highway above the windowed tunnel there, protests the proposed plan of a Portland civic organization to name the promontory for Colonel McAlexander. Mr. Locke, who said the west side of the cliff is owned by C.W. 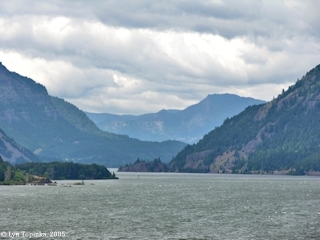 Parker and the southern portion by Seneca Fouts of Portland, protested the application of the name "Storm King", as the promontory was said to have been called by Indians, when Mitchell's point tunnel was first opened. Mr. Locke, who says that he has a letter from an ex-governor, supporting him in his protest, cites that in extremely early pioneer times a man by the name of Mitchell settled at the east foot of the towering promontory." Source: "Morning Oregonian", September 30, 1921, courtesy Historic Oregon Newspaper Archives, University of Oregon Libraries, 2015. The Wygant State Natural Area (south and west of Mitchell Point), Seneca Fouts Memorial State Natural Area (east of Mitchell Point), and the Vinzenz Lausmann Memorial State Natural Area (west of Mitchell Point) were all aquired to protect the scenic Mitchell Point area. 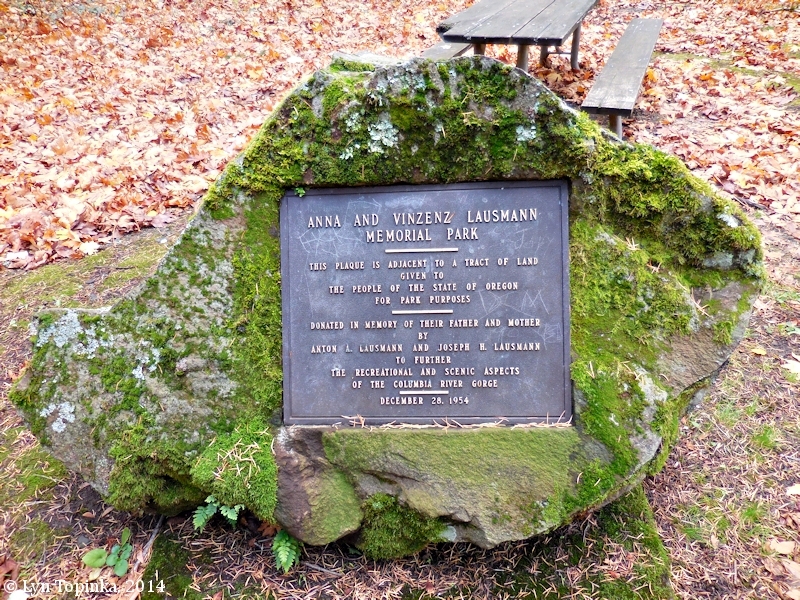 Click image to enlarge Lausmann Memorial Park, Mitchell Point, Oregon. Image taken November 10, 2014. 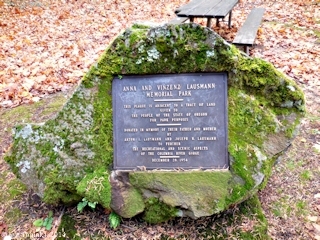 Click image to enlarge Plaque, Lausmann Memorial Park, Mitchell Point, Oregon. 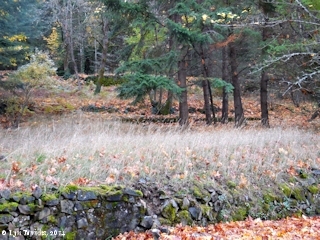 Image taken November 10, 2014. 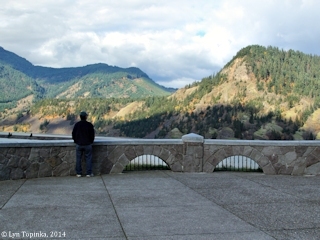 A "Mitchell Point Overlook" of the Columbia River Gorge is easily accessible from the eastbound lanes of Interstate 84. 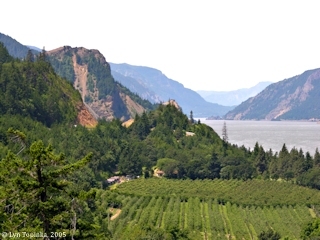 The viewpoint offers good views of the Columbia River, Washington State's Drano Lake, Washington State Highway 14 Tunnels, and remnants of the old Broughton Flume. 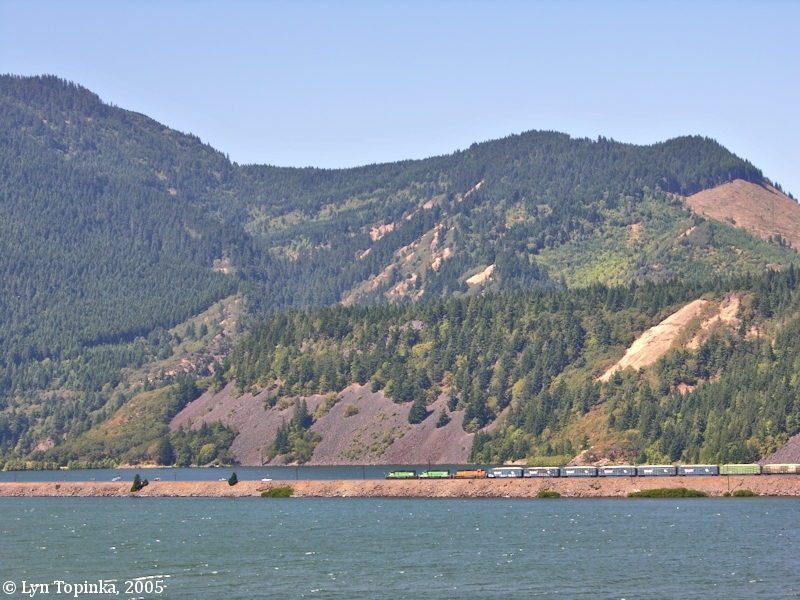 Click image to enlarge Chemawa Hill, Washington, as seen from Mitchell Point, Oregon. Image taken April 19, 2018. Click image to enlarge Columbia River looking downstream from Mitchell Point, Oregon. Image taken August 27, 2005. Click image to enlarge Drano Lake from Mitchell Point. Image taken August 27, 2005. Click image to enlarge Washington State Highway Tunnel No.2 from Mitchell Point. Railroad Tunnel No.3 is not visible behind the trees. View of the west portal. Image taken June 4, 2005. Click image to enlarge Broughton Flume on slope above Washington State Highway 14 Tunnel No.3. View of Tunnel No.3's west portal. Image taken June 4, 2005. Click image to enlarge Penny Postcard: Mitchell Point Tunnel and the Columbia River Highway, ca.1920. Penny Postcard, ca.1920, "Mitchell's Point, Columbia River Highway, Oregon.". Caption on back reads: "Mitchell's Point. 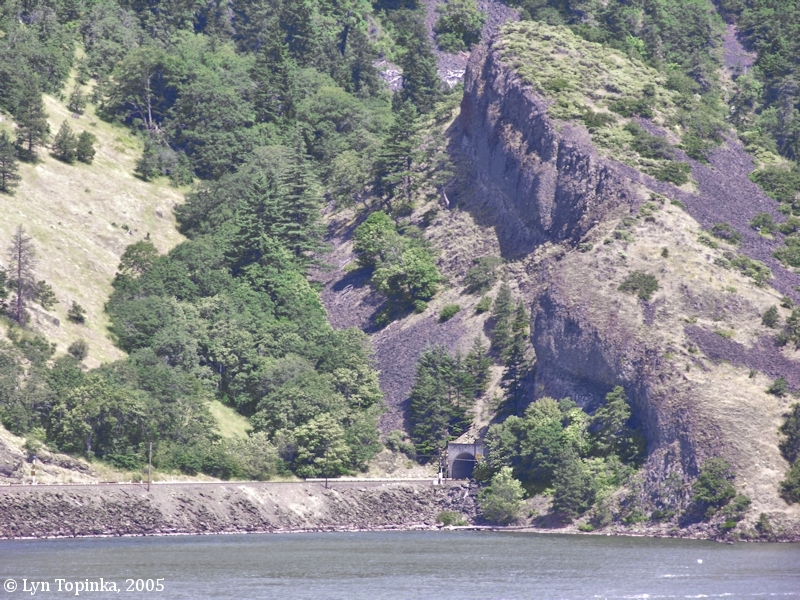 This picture shows the west approach to tunnel at Mitchell's Point, which is locaed beyond Cascade Locks and near Hood River. This tunnel has five gigantic windows overlooking the Columbia and the mountains beyond, and is particularly interesting because it is the most expensive piece of construction on the highway.". Published by Chas. S. Lipschuetz Company, Portland, Oregon. Card #327. In the private collection of Lyn Topinka. Click image to enlarge Penny Postcard: Mitchell Point Tunnel, also known as "Storm Crest Tunnel", with steamer, ca.1920. Penny Postcard, ca.1920, "Windows in Storm Crest Tunnel, Columbia River Highway.". Handwritten note on back states that the steamer is the "Bailey Gatzert". Copyright Weister Co., Published by Chas. S. Lipschuetz Company, Portland, Oregon. Card #323. In the private collection of Lyn Topinka. Caption on back reads: "Storm Crest Tunnel. Not only is Storm Crest Tunneled, but it has five gigantic windows overlooking the Columbia and the moutains beyond. Nothing like it is known anywhere, save in a certain point in France and in the famous Axenstrasse along the shore of Lake Lucerne, in Switzerland, and that has only three windows, while Storm Crest has five. It also has parapets at the windows and seats for vistors within.". Click image to enlarge Penny Postcard: Mitchell Point Tunnel, ca.1920. Penny Postcard, ca.1920, "Mitchells Point Tunnel. Columbia River Highway, Oregon.". Sawyer Scenic Photo. Card #C-G50. In the private collection of Lyn Topinka. Click image to enlarge Penny Postcard: Mitchell Point Tunnel, ca.1920. Penny Postcard, ca.1920, "Interior Mitchell Point Tunnel, Columbia River Highway, Oregon.". Published by The Oregon News Co., Portland, Oregon. Card #59. In the private collection of Lyn Topinka. Click image to enlarge Penny Postcard: West Entrance, Mitchell Point Tunnel, ca.1921. Penny Postcard, Postmarked 1921, "West Entrance to Mitchell's Point Tunnel, Columbia River Highway, Oregon.". Caption on back reads: "This view gives one a very clear idea o the cost and ingenuity of the engineers who had charge of the construction.". Published by The Oregon News Company. Card #O-46. Card is postmarked May 26, 1921. In the private collection of Lyn Topinka.